The earth is made up of 71 percent water. Our bodies are made up of 78% water when we are born and usually about 60% as we get older. You can live 110 days without food but you can only go three weeks without water or you will die. Water is life. We need to drink half our bodies weight in water each day. For example, if you weigh 200 pounds, you should be drinking 100 ounces of water everyday. I recommend drinking water with minerals from pink Himalayan sea salt, which contains 86 minerals. Avoid having Pedialyte or Gatorade because it has added sugars and food dye. Also, coffee and soda do not count as water. When you drink water is also important. You should be drinking two glasses when you wake up, a glass 30 minutes before breakfast, 30 minutes before lunch, 30 minutes before dinner and one glass before bed. Don’t drink water after a meal because it dilutes the food making it harder to digest. Drinking water before meals has been shown to help lose weight, as well. If you are working out and sweating you will need to drink additional water. If you are on your period, you must drink more water because it will help prevent PMS, cramping and irritability. Many headaches are due to dehydration. 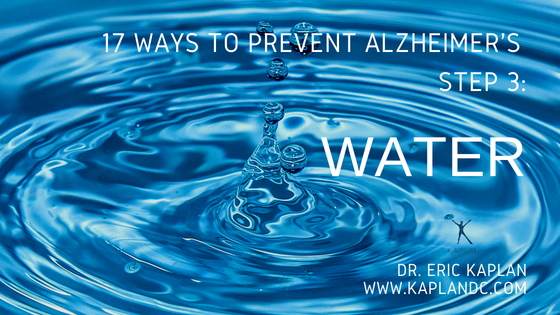 Don’t take an aspirin, drink more water. If you have food poisoning, drink more water. If you go out drinking alcohol, you must have one cup of water for every shot, glass of wine or beer you consume. 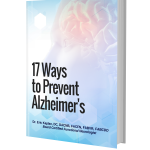 Keeping the brain hydrated is important for the prevention of Alzheimer’s. Do not let your brain shrink like a dehydrated fruit. Keep it hydrated and your brain will function at optimal levels. If you are interested in Dr. Kaplan’s services please contact us at 212-620-8121 (NY) 201-261-2150 (NJ) or visit our website www.kaplandc.com.